On November 16, Congressman Joe Courtney (D-CT) introduced legislation aimed at curtailing the rising rates of on-the-job violence facing health care and social service employees such as nurses, physicians, emergency responders, medical assistants, and social service workers. The Workplace Violence Prevention for Health Care and Social Service Workers Act, H.R. 7141, directs the Occupational Safety and Health Administration (OSHA) to issue a standard requiring health care and social service employers to write and implement a workplace violence prevention plan to prevent and protect employees from violent incidents. A final standard shall be issued within 42 months of enactment. Work with employees (and their representatives where applicable), to identify workplace violence risks to employees in their particular workplace, including environmental risk factors, risk factors specific to the patient population, and past violent incidents. Include work practice controls such as security, staffing, and training on de-escalation techniques, and environmental controls such as personal alarm devices, adequate exit routes, surveillance monitoring systems, barrier protection, entry procedures, and weapons detectors. Outline procedures for reporting, responding to, and investigating incidents, and providing medical care and first aid to affected employees. Include procedures for training the workforce, in coordination with other employers who have employees who work at the site, and an annual evaluation of the plan. Investigate each incident of workplace violence as soon as practicable, document the findings, and take corrective measures. Provide annual in-person training and education to employees; and additional training when employees are reassigned. Record workplace violence incidents in a Violent Incident Log (“Log”). 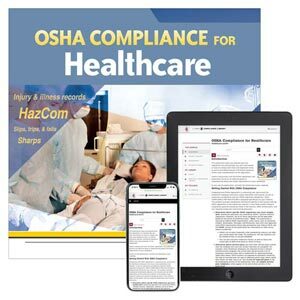 Post an annual summary of the in the workplace in a manner similar to the OSHA Annual Summary of Injuries and Illnesses and transmitted to OSHA. Maintain records related to the plan, giving employees the right to examine and make copies of the plan, the Log and related documents, with appropriate protections for patient and worker privacy. Not retaliate against a covered employee for reporting a workplace violence incident, threat, or concern to an employer, law enforcement, local emergency services, or a government agency would be prohibited. A violation of this prohibition would be enforceable as a violation of an OSHA standard. The measure was referred to the Committees on Education and the Workforce, Energy and Commerce, and Ways and Means. This article was written by Darlene M. Clabault, SHRM-CP, PHR, CMLS, of J. J. Keller & Associates, Inc.